““Is it the goal of the NSA to collect the phone records of all Americans?” Senator Mark Udall asked at the Committee hearing. 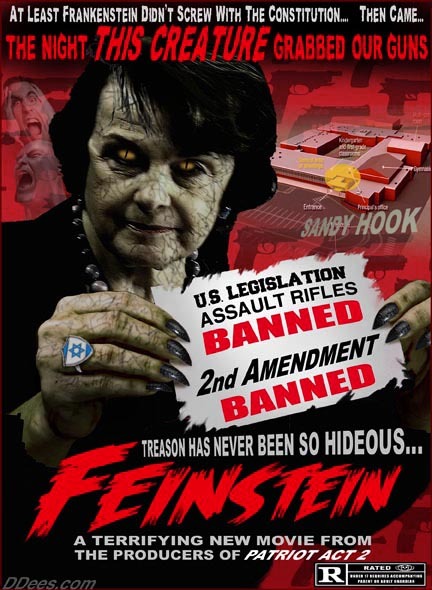 …In the hearing, Feinstein said the surveillance programs were necessary because they protected Americans from terror attacks akin to this week’s massacre in the shopping mall in Kenya’s capital, Nairobi. “The death and destruction we saw at the Westgate mall in Nairobi could have been at a mall in the United States,” Feinstein said. k) So Feinstein wants the public to believe that by having every single call, e-mail and or any other form of communication recorded throughout the U.S. & the world: That this data bank can be accurately-activated and consulted ­ then acted upon within hours to stop “Terrorist Attacks” inside the US? This Chairwoman of the Senate Intelligence Committee has just proposed another massive Oxymoron to go with all her other moronic ideas that she continues to demand from the public. Feinstein has to be arrested and charged for demanding that the public become an accessory before the fact in the next “terror-attack” which her “policies” would guarantee success to ­ precisely because her solutions cannot ever work in anything but a comic-book about an all-knowing-government which is totally deaf dumb and blind to the realities of life in 2013.
k) How is it that “terror-suspects” are allowed into the country? Wasn’t the reason given for creating the DHS, the NO-FLY LISTS, the FBI, the CIA and a host of other agencies to absolutely prevent “terrorists” from getting in, or from traveling once they get here? Feinstein can’t have this both ways. How much longer will the people of this place continue to put up with the treasons and the moronic-antics of Feinstein!